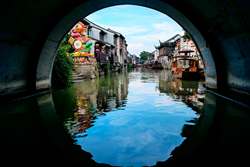 "A Curated Look at Suzhou's Arts & Culture - No Visa Required"
Suzhou Tourism announces the launch of its newest social media campaign - "A Curated Look at Suzhou's Arts & Culture - No Visa Required" - a one-year campaign focused on Suzhou’s rich history of art and culture. Targeted at North American travelers the program includes content creation, online contests, consumer engagement, offline events, interactive online videos, and influencer partnerships all aimed at increasing visibility and awareness for the destination across various digital and social media platforms, specifically its website TravelToSuzhou.com, Instagram, YouTube, Facebook, and Twitter. Suzhou Tourism will host three social media contests between now and May 2017 – one each on Instagram, Facebook, and Twitter – aimed to educate travelers about Suzhou’s art and culture, positioning the city as an artistic epicenter of China. Additionally, Suzhou Tourism has partnered with travel expert Julia Dimon, who will share her personal experiences of visiting Suzhou through a video interview and digital programing. Beyond the online engagement, Suzhou Tourism will leverage partnerships with iconic cultural institutions across North America to provide synergistic events and happenings. These will include several events on both the East and West Coasts of the United States, which are key feeder markets to Suzhou in particular and China at large. The prospective events will reflect the new social media campaign’s theme, including collaborations with top cultural festivals and international museums such as the DeYoung Museum in San Francisco and the JFK Library in Boston. The comprehensive 12-month program is designed to take a holistic approach in engaging consumers with the Suzhou travel experience through consistent messaging and a continuous schedule of online and in-person interactions. Travelers can follow the campaign by visiting the website TravelToSuzhou.com and following the destinations Instagram, YouTube, Facebook, and Twitter channels. The "A Curated Look at Suzhou's Arts & Culture - No Visa Required" campaign builds off an established social media presence Suzhou Tourism has built amongst North American travelers, stemming from dedicated efforts that began in August 2015 and have entailed a blogger media tour in Suzhou, online sweepstakes, monthly giveaways, social media advertising, and more. For more information on Suzhou please visit http://www.TravelToSuzhou.com.